>>>>captures the formal model of the ISO standard. >4) SKOS would benefit from the insights of ISO 25964 design team. >>>>guideline for SKOS - ISO thesaurus transformation. >willingness to build upon the past within a stricter frame. 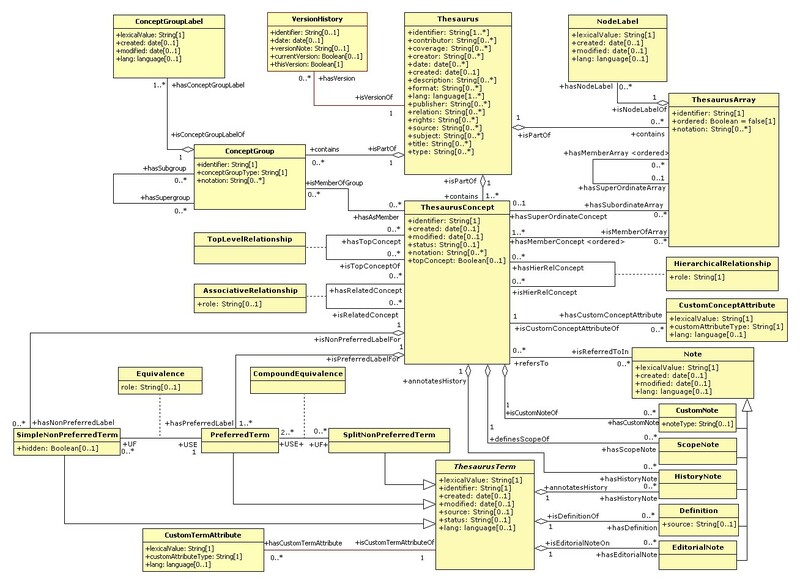 >complete data model of ISO can be mapped in SKOS(-XL). my best to clarify any further points if anyone asks. >written from multiple coordinated concepts. >A reified label of a coordination concept could include an rdf:Seq. neither SKOS nor the ISO model yet provide for this. probably involve a solution on the lines that Christophe suggests above. adding this to the model below? hard" to deal with within the time available, e.g. Can we look at it again now? Next message: Thomas Bandholtz: "RE: Label management information in SKOS-XL (continuing from UMTHES and SKOS-XL)"
Previous message: paul.mohr@servicebirmingham.co.uk: "Re: AW: [Dbpedia-discussion] Using DBpedia resources as skos:Concepts?" In reply to: Johan De Smedt: "RE: Label management information in SKOS-XL (continuing from UMTHES and SKOS-XL)"
Next in thread: Aida Slavic: "Re: Label management information in SKOS-XL (continuing from UMTHES and SKOS-XL)/ other data elements"
Reply: Aida Slavic: "Re: Label management information in SKOS-XL (continuing from UMTHES and SKOS-XL)/ other data elements"